An intense earthy and smoky heat doesn't mask the excellent progression of flavors in this sauce that includes a honey-molasses sweetness, fruity tomato, onion, and garlic. Swanky Sauce was literally born down on the farm. 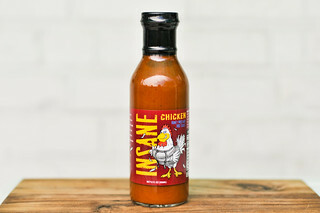 Aaron and Liz Syman are owners of Syman Says Farms in Salem, CT where on top of they chickens and goats they raise on their 10 acres, they also produce this sauce. Just like their focus on quality and care of their animals, they put as much attention into creating a sauce that's made from all natural ingredients with no corn syrup or artificial flavors. 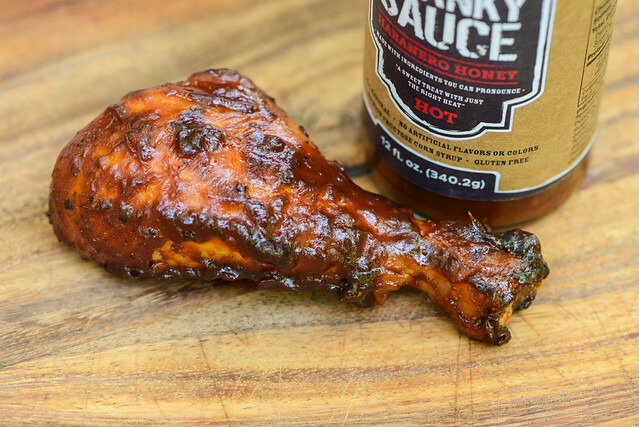 Their first recipe was for Habanero Honey barbecue sauce, but they recently added a mild honey version as well. First whiff of this sauce has a strong hint to the heat below. There's an earthy and smoky hot pepper aroma that stands out against the also dominant deep tomato and mustard components. There's only a mild sweetness, which gives the tomato a deeply acidic smell that is intensified by vinegar. Also present are sharp onion-y notes and, to lesser extent, garlic. This rusty red sauce has a semi-glossy sheen and a lot of texture thanks to what looks to be chunks of onion and/or garlic. Although it's opaque, you can clearly see a lot of small and medium specs of spices that come in orange, black, and white. It has a thickness that sits right at medium and falls in a fast, uneven, chunky pour from a suspended spoon. Once the final drips of sauce have released, a medium coating is left cling to the silverware that lets you more clearly see the veggie chunks and numerous spices. There's more sweetness in the first taste than what you'd expect based on the aroma, but it's not overly sweet. There's isn't a strong sugary flavor, but instead, a deeper sweetness that's created by a combination of honey and molasses. As the sauce settles on the tongue, there's a smooth transition from sweet to tangy with a fruity tomato component persisting throughout. As the vinegar intensifies, there's fleeting tastes of onion and garlic that quickly get drowned out by an intense heat. This fiery spice is layered with smoky, fruity, and earthy notes, but the main characteristic is the intense burn it builds up to—one so strong it brought on a hiccup reaction in me. In the end, this leaves a mouthful of fire with a little tang and tomato flavor persisting as well. The sauce coated the chicken in a thick, textured layer that baked down well over indirect heat. There was slight burn off when the chicken was moved to direct heat, as well as decent caramelization. The heat after being cooked mellowed a bit, but the sauce we still plenty hot. It continued to produce a lip tingling heat, but didn't elicit hiccups anymore. This was due to the better balance it achieved with a heightening sweetness that still retained its molasses and honey character. With the changed flavor profile, some of the more nuanced ingredients like onion and garlic were lost, but the tanginess persisted, which helped create an overall robust and excellent flavor that ensured not one piece of that chicken leg was dull at all. 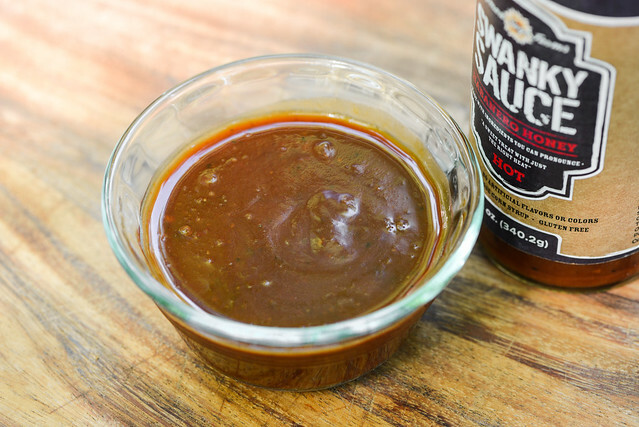 I love a good spicy sauce, and love sauces that really layer and transition their flavors well, and Swanky Sauce Habanero Honey succeeded on both of those fronts. The intense heat out of the jar may be too much for some, but it wasn't so ridiculously hot that it kept me from taking spoonful after spoonful to be able to taste all the good stuff going on over and over. I will say though, after too many tastes of the sauce, my mouth was left so on fire that it started to become difficult to taste anything by heat. So while I loved the sauce out of the jar, I think it'd be best used sparingly given its power. After being cooked was another story though—since the sauce's heat balanced better with the sugar, it created one powerhouse piece of chicken. 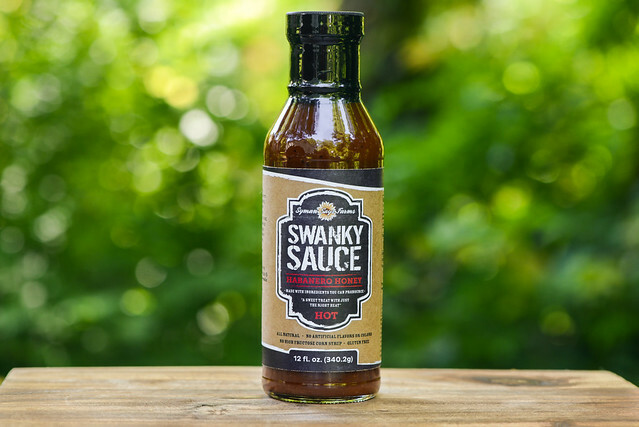 I wouldn't hesitate to use this sauce into use in most grilling and barbecue situations—chicken, pork chops, ribs, brisket...they'd all love some Swanky Sauce that has a great barbecue flavor made from quality ingredients. 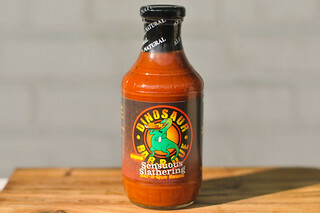 Hope I've convinced you enough that this is one sauce you'd want to try out, and luckily Aaron sent an extra bottle for me to giveaway to you Meatwavers so you can do just that. 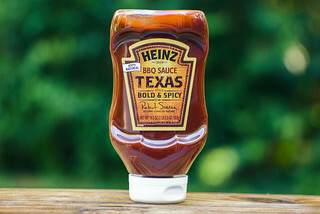 If you'd like to be entered to win this bottle of sauce, all you have to do is comment on this post with what was your best bite over of Memorial Day weekend (hopefully it was something grilled or smoked, but doesn't have to be). Deadline for entries is 11:59pm on Tuesday June 7, 2016. Read the official rules for more details. One entry only per individual. Good luck! Smoked tri-tip sliders with horseradish sauce. I had the most amazing chicken. It was some sort of heritage breed that someone talked me into getting and I used your rotisserie chicken recipe (the original plan was jerk chicken, but that seemed like a bad way to learn anything about the flavor of the bird). Had a busy weekend, so nothing fancy. A grilled burger, hand pattied and well salted. Classic American grilled Cheeseburger. American cheese - keeping it simple, in honor of America - pickles, and ketchup: all that a burger needs. The best thing I grilled over Memorial Day was organic, free range beef hamburgers medium rare with lettuce and tomato .